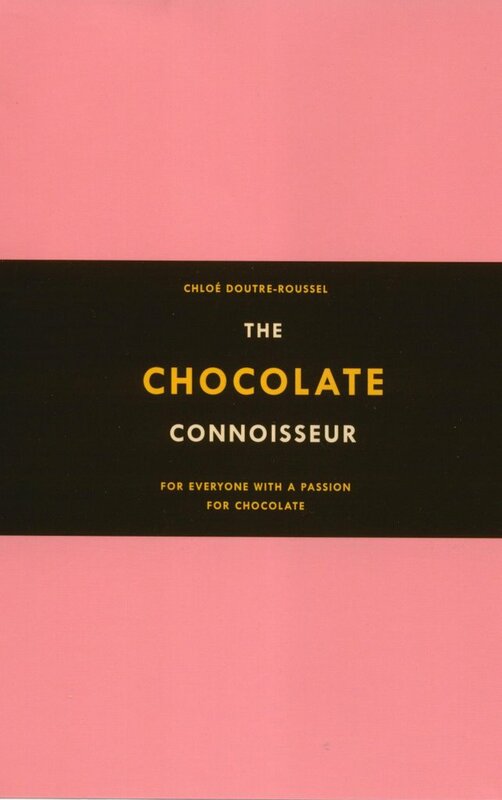 I just began reading a delightful book called The Chocolate Connoisseur: For Everyone With a Passion for Chocolate by Chloe Doutre-Roussel. The lovely pink-jacketed book (which can be packaged together with a selection of artisanal chocolate bars as a gift) is a gem of clearly outlined chocolate information whose only drawback is a bit of muddy marketing. I couldn't tell from the book's appearance or from its promotional website whether this new addition to the field of chocolate literature was a historical overview of gourmet chocolate or the memoir of its author, a former chocolate buyer for Fortnum & Mason in London. Before I received a copy in the mail, I'd assumed The Chocolate Connoisseur to be a combination of the two genres, both of which are currently fascinating to readers but also redundant since so many chocolate-themed chronologies and personal stories are already on the market. Once I opened the front cover, I realized that Chloe Doutre-Roussel's book is in a category all it's own--it's a how-to book. The Chocolate Connoisseur is a clearly-documented, engagingly-written, step-by-step guide to how to understand, select, and eat high-quality chocolate. Though I'm only a few chapters in, I can already say that this is an incredible resource. Doutre-Roussel (a self-described "dedicated choco-explorer") leads readers through "building your own chocolate profile," putting together a "survival kit" or your favorite products, and "learning to taste." Along the way, she points to specific brands, suppliers, and chocolate organizations. The author (also formerly an agronomist for the UN) colors in the story of gourmet chocolate more deeply by providing the appropriate social and historical context; she does not shy away from discussing the fact that the producers of chocolate's main ingredient, cacao beans, are usually poor, developing-world farmers who see a minimal portion of the industry's excessive profits and have little incentive and few options for improving the quality of the raw ingredients they supply. The information provided in this book is desperately needed. While researching and writing about the world's array of chocolate on this website, I've come up against a sad lack of knowledge about what chocolate is and how it should taste. In the past two weeks, at least two people have fed me the same line, verbatim: "I don't like dark chocolate." In their defense, I didn't like dark chocolate either when the only kind I knew about was "Hershey's Special Dark." That kind of mass produced candy is mostly sugar and artificial additives combined with a small quantity of poorly-treated cocoa solids--no wonder people prefer the sweeter, creamier milk chocolate varieties. But a true bittersweet chocolate, made with carefully-selected and even-more-carefully roasted cacao beans, has a wonderfully complex, fruity flavor that's never chalky or bitter. Even the professionals and employees in the chocolate industry have disappointed me. At Melbourne's new Chocolateria San Churro (see "More Chocolate in Melbourne"), my inquiries into their product led me into conversation with an embarrassingly ill-informed staff member who told me that the shop owner imported beans that were grown in Europe and then had them turned into chocolate locally. Actually, dear, the beans are grown in equatorial Latin America and Africa. And, again, at the closet-sized Just William Chocolates in Sydney's posh Paddington neighborhood, a woman who had every appearance of being the proprietress answered my inquiry into the origins of her couverture with the description, "basically Belgian chocolate." When I found her vague answer (and her dismissive attitude) to be unimpressive, I probed further. She then told me that the chocolate was made for her by a confectioner, "using our recipes." "You mean they make the chocolate? From the beans?" I asked, dubious. "Yes," she answered, ending our conversation. Possible--but very unlikely. More probable was that this woman had no idea where her chocolate originated. It's tempting to write all this chocolate ignorance off as an Australian problem, but I fared no better the last time I was in New York (one of the world's chocolate capitals), at the city's premier tasting room for the chocolates of Michel Cluizel (one of the world's most exclusive chocolatiers). I visited within a few weeks of the opening and was overwhelmed both by the aromatic array of chocolate bon bons and the shockingly ill-trained attendant who, as far as recommendations were concerned, could only muster "this one is good if you like hazelnuts, because it has hazelnuts." Public education about chocolate is in order--and Chloe Doutre-Roussel has provided us with a definitive text. thanks for the info. I wondered about this book. btw, came across your blog by accident. love it!